Charleston Voice: Alabama's Judges & Gay Marriage: Obey God Or Man? 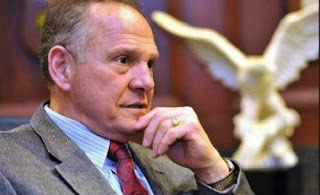 Alabama's Judges & Gay Marriage: Obey God Or Man? If you haven’t watched the news closely, you might have missed a significant cultural and legal battle taking place in Alabama. To summarize, Alabama Chief Justice Roy Moore is urging state officials to defy a federal court ruling that legalized gay marriage in the state. Moore appeals to the fact that the commands of God supersede the decisions of the federal court, and therefore he must follow God. He also argues that one federal judge cannot make law for an entire state, and that “dual sovereignty” allows him to do what he’s done. Alabama’s constitution defines marriage as between a man and a woman. But is it morally and biblically right for him to refuse to grant that which a federal court has said is lawful? Aren’t We Supposed To Submit To Authority? In the book of Romans, the Apostle Paul wrote, “Let every person be subject to the governing authorities. For there is no authority except from God, and those that exist have been instituted by God. Therefore whoever resists the authorities resists what God has appointed, and those who resist will incur judgment” (Rom. 13:1-2). It would seem at a cursory view, then, that Chief Justice Moore is wrong for opposing the federal court. But what do you do when the governing authority gives direction that is counter to the commands of God? Jesus was asked by an expert in the Law as to what was the greatest command in the Law. The lawyer was trying to back Jesus into a corner by putting Him in a position in which he would have to choose one law over another. However, Jesus’ answer silenced his critics: “You shall love the Lord your God with all your heart and with all your soul and with all your mind. This is the great and first commandment” (Matt. 22:37-38). Jesus wasn’t interested in politics or popular culture; instead, He was concerned with the name and glory of God above all else. John later writes that love for God is “to keep His commands” (1 Jn. 5:3). To take a command of Scripture and diminish it in the name of a government decision is to cease to love God because in essence one is saying, “God, get with the times. You’re too outdated and your commands are not progressive enough.” May it never be that we would say such a thing. So how does one resolve this apparent tension between submitting to the governing authorities and loving God by keeping His commands? The answer is found in the following question: What is the supreme law? It is the commands of God. This means that we are to submit to the governing authorities when their policy does not interfere with Scripture; but when it does go against the commands of Scripture, we must be faithful to the commands of God. This is precisely how Peter and the apostles responded when they were commanded by the high priest not to teach about Jesus again. “We must obey God rather than man,” they replied (Acts 5:29). The Apostle Paul wrote to the church in Galatia: “For am I now seeking the approval of man, or of God? Or am I trying to please man? If I were still trying to please man, I would not be a servant of Christ” (Gal. 1:10). There were many times in the early church when Christ followers had to do unpopular things that were not received well by the local governing authorities. While they never led a rebellion, but instead were peaceful in their objection to the laws, they were still unwilling to dishonor God. When Christians were told to worship Caesar as a god, they had a choice to make: Submit to the governing authorities and dishonor God, or honor God and reject this specific policy, incurring the subsequent punishment (Death!). When they chose the latter, Caesar was not happy, but God was. For those who follow Christ, the answer is simple: We seek the approval of God. We should pray for our leaders (1 Tim. 2:1-3), let our conduct silence our critics (1 Peter 2:15), while always putting the commands of God first. The response, however, is not to start a revolt or call down fire from heaven. Instead, it is our responsibility to be respectful, peaceful citizens while making it clear why we are unable to accept a ruling that so blatantly goes against the commands of Scripture.